Sunrise Movement is affiliated to Justice Democrats and to Data for Progress. Hey everyone! Sunrise needs your help! We’re looking for connections in MN, MI, NY, FL, and PA.
Sunrise is going on a speaking tour again this Spring! Our trained Speakers will talk to thousands of young people about climate change, why it's happening, and how we can link arms across this nation to stop it together. If you know HS teachers, professors, pastors, community leaders, or friends who can connect us to these kinds of people in these five states - tag them here/have them fill out the form (https://www.sunrisemovement.org/host/). Hit me up if you have questions/ideas! — with Alex Mijares, Tiffanie Jeffreys, Garrett Blad and Dyanna Jaye. UPDATE: the 51 Sunrisers arrested at Nancy Pelosi's office have been released. We would like to thank them for their sacrifice, for holding their ground, and making sure our voices were heard. — with Cody Jay Purchase, Hope Kogod, Lauren Maunus, Emerson Michael Skufca, Jasper Baldwin, Arjun Jayaraman and Shelby Krohn. Just hours ago, these 8 brave youth were released from NY 7th Precinct after Governor Cuomo had them arrested. Today was his last chance to pledge #NoFossilFuelMoney and he's made his choice clear: he will protect Big Oil over our futures once again. Donate today to help us take on politicians like Cuomo in 2018. http://bit.ly/cuomo-reject-fossil-fuel-money — with Gabriel Reichler, Elise Ferguson, Sara Blazevic, Victoria Fernandez and Miles Goodrich. “I founded Sunrise Movement last year in order to kick out corrupt politicians backed by Big Oil and elect a new generation of leaders who will fight for my generation. Last night was bittersweet. Young people voted in record numbers, many supporting visionary campaigns that imagined a more just and fair America that takes the climate crisis seriously. In fact, 19 of the 34 new House Democrats won without a dime of money from fossil fuel CEOs and lobbyists. This is unprecedented and should be celebrated. Still, our political system continues to be rigged in favor of the rich and powerful who spent hundreds of millions of dollars to block candidates and ballot measures that threatened their profits. Moments ago, newly-elected Alexandria Ocasio-Cortez, the youngest Congresswoman in history, joined us at Speaker Pelosi’s office to help us change the course of the Democratic Party and give our generation a shot at a livable future. 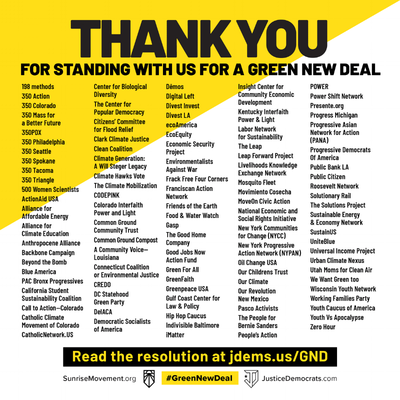 Sign here to tell Nancy Pelosi to support a #GreenNewDeal in line with what the science demands: https://bit.ly/PelosiNeedsAClimatePlan — with Mohamed Deeq Ismail, Jasper Baldwin, Annemarie Manley and Emerson Michael Skufca. More names had been added by January 11, 2019. This page was last modified on 12 January 2019, at 14:15.